"Each new situation requires a new architecture. " Jean Nouvel (born August 12th, 1945) is a French architect. Nouvel studied at the École des Beaux-Arts in Paris and was a founding member of Mars 1976 and Syndicat de l'Architecture. He has obtained a number of prestigious distinctions over the course of his career, including the Aga Khan Award for Architecture (technically, the prize was awarded for the Institut du Monde Arabe which Nouvel designed), the Wolf Prize in Arts in 2005 and the Pritzker Prize in 2008. A number of museums and architectural centres have presented retrospectives of his work. 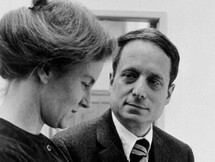 Nouvel was born as the son of Renée and Roger Nouvel who were teachers. His family moved often when his father became the county's chief school superintendent. His parents encouraged Nouvel to study mathematics and language, but when he was 16 years old he was captivated by art when a teacher taught him drawing. 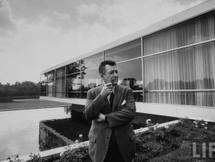 Although he later said he thought that his parents were guiding him to pursue a career in education or engineering, the family reached a compromise that he could study architecture which they thought was less risky than art. Nouvel had three different partners between 1972 and 1984: Gilbert Lezenes, Jean-François Guyot, and Pierre Soria. In 1985, with his junior architects Emmanuel Blamont, Jean-Marc Ibos and Mirto Vitart, he founded Jean Nouvel et Associés. Then, with Emmanuel Gattani, he formed JNEC in 1988. Ateliers Jean Nouvel, his present practice, was formed in 1994 with Michel Pélissié and is one of the largest in France, with 140 people in the main office in Paris. 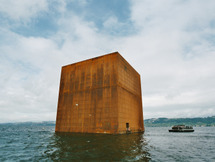 Ateliers Jean Nouvel site offices are in London, Copenhagen, New York, Rome, Madrid and Barcelona. As of 2008, they are working on 40 active projects in 13 countries. Nouvel designed a flacon for L'Homme, an Yves Saint Laurent fragrance, in a limited edition launched in 2008.